Opened in 2004 at a price tag of approximately three million USD, the Ho Thuy Tien water park opened its gates to the public when it was only partially completed. Bankrolled by Company Hue Tourism, debuting a half-finished dream turned out to be a bad business move; but, in an odd turn of events, ever since its closure, the park has provided Hue's tourism industry with an off-the-books boon they never could have seen coming. 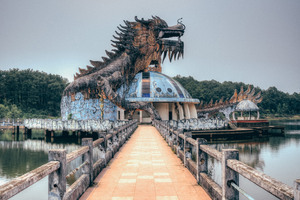 In the heyday of Ho Thuy Tien, adults and children alike were magnetically attracted to the park's signature giant, three-story-tall dragon aquarium. Rising from the lake at the park's center, manta rays and sharks lined the walls of the interior staircase, built to resemble a dragon's rib cage. On all sides of the dragon's bowels were aquarium tanks full of live fish and crocodiles. These crocs would later rival the dragon as superstars of the abandoned park, as well. Even with an excited population of park-goers flocking to Ho Thuy Tien, drawn by the promise of cool waters and good times, something was amiss. Within just a few years, the business continued to experience problems. After it shuttered, plans to resurrect the park from its fiscal troubles by turning it into an eco-park swirled throughout Hue's local media as recently as 2013. Instead, those revitalization plans died on the table, leaving the park to become a legendary destination for travelers to the region. Located ten kilometers outside of town, Ho Thuy Tien now exists in a sort of purgatory between worlds. When business was booming, the park was an easy-to-find destination, listed in guidebooks; no longer the case, Ho Thuy Tien is now – justifiably or not – a sort of badge of honor among travelers, with its coordinates passed from one another by word of mouth, though it's just as easily Google-able. Located eight kilometers out of town, the park isn't exactly easy to get to, but once there, visitors may be surprised to find a quasi-guard posted at the gate collecting "admission" to the site. Sometimes there's even a refreshment cart in operation inside the abandoned park.